The weather’s getting warmer and that can mean only one thing: barbecue season. Nothing’s better than getting your friends and family together, lighting up the grill, throwing some meat on it, and enjoying some laughs. While your neighbor down the street may be known for throwing the best cookouts, who’s to say you can’t become king of the backyard barbecue this year? While you might be read for a party, is your backyard? Lane’s Landscaping Supplies suggests planting some fresh greenery, mulching beds, and cutting the lawn the day before the party. The backyard should be clear of debris and safe for kids to run around. Are you still working with your old charcoal grill that’s supported by a shaky tripod? It’s time to step up your game this spring by investing in premium brands like Lion, Primo, or Lynx. Having a quality grill or smoker automatically enhances your credibility and sets a party off on the right note. This tip cannot be stressed enough: prep your food ahead of time. You don’t want to start brining your chicken or marinating your meat when guests are arriving. Have everything – including salads, veggies, and sides – prepped a few hours before guests arrive so that you can focus on grilling and socializing when it’s time. 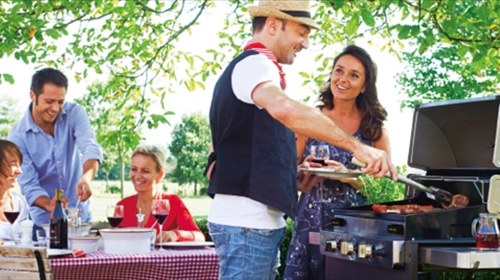 If you’re not using a gas grill, it’s also a good idea to have your fire already lit. The last thing you want is a bunch of guys telling you how to manage your flames. You need extra everything on hand. This means extra food, drinks, utensils, paper products, ice, charcoal, propane, and anything else you might need. Stuff has a tendency to run out quicker than you might think (you’d be surprised how much people eat over the duration of a party) and you don’t want to be making any impromptu trips to the store. There’s nothing worse than having hungry guests constantly looking your way to see when the meat’s coming off the grill. Keep guests happy and satisfied by offering a few different appetizers. Ensure the drinks are cold. Nobody likes warm drinks! Make sure you have plenty of room in your refrigerator or coolers for water, soft drinks, wine, beer, and whatever else your guests are drinking. If people are bringing their own drinks, don’t automatically assume they’ll bring their own cooler. It’s a good idea to always have extra space available. Above all else, remember to keep a relaxed atmosphere. If you’re stressed out, your guests will probably find it difficult to relax themselves. Remember that it’s a backyard barbecue, not a board meeting. Don’t set rigid guidelines or over plan things. Go with the flow, have a drink, and enjoy the company of good friends. Hosting a killer backyard barbecue isn’t easy – but it certainly isn’t impossible. By keeping these tips in mind and remembering to let loose a little, you can quickly establish yourself as a good host. The only question left to ask is, when will you throw your next party?